“Security has been, is and will be a priority for us. A moment ago, I signed one of the most important planning documents: the Technical Modernization Plan until 2026. The plan assumes modernization worth PLN 185 billion, -- PLN 45 billion more than the previous plan. This is a record plan when it comes to cost. 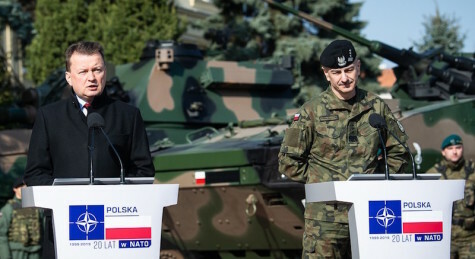 This is obviously a major challenge, but also an opportunity to develop the defense capabilities of the Polish Army,” said Minister of National Defense Mariusz Błaszczak after signing the Technical Modernization Plan. On Thursday, at the General Headquarters of the RSZ in Warsaw, the head of the Ministry of National Defense met with the commanding staff of the Polish Armed Forces. “We will change the face of the Polish Army in a decisive and effective manner, we will equip the Polish Army with modern equipment. A larger Polish Army is another goal I set for myself. We will be consistent in these activities. The technical modernization plan is a roadmap. This document forms the foundation for the development of the Polish armed forces,” the minister said after the briefing. Minister Błaszczak emphasized that the programs included in the document signed today reflect the challenges facing the Polish Army and the Ministry of National Defense. One of them is the strengthening of the eastern flank, and thus the formation of a new, fourth division of the Polish Army. “I set up a new division located east of the Vistula. As a rule, modern equipment will be directed there. 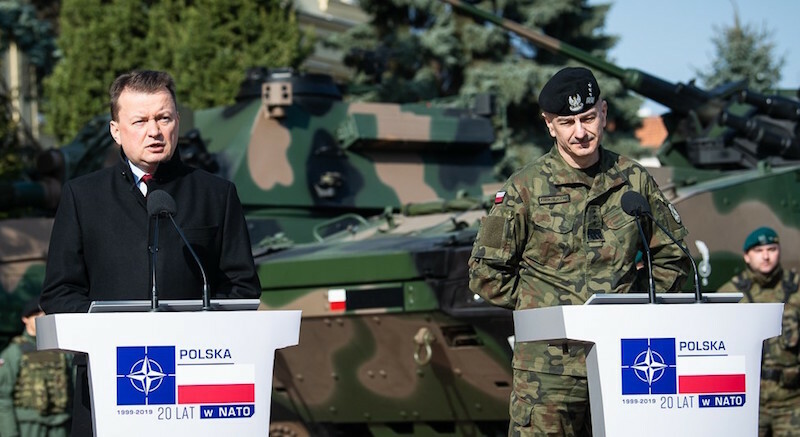 Strengthening the eastern flank is a measure aimed at strengthening the capabilities of the Polish Army, but it also constitutes a significant strengthening of the entire NATO eastern flank,” the minister stressed. In the document signed today, the Harpia program is the most important - the purchase of fifth generation aircraft. As Minister Blaszczak pointed out, new aircraft are essential equipment, and its purchase for the Ministry of Defense's leadership is a priority. “I expect both the head of the General Staff and the head of the Armament Inspectorate to take immediate action to accomplish this task. We want to buy 32 multi-role aircraft of the fifth generation,” he said. Among the priority tasks set out in the modernization plan are the Narew program (acquisition of short-range anti-aircraft missiles for combating, among others, unmanned aerial vehicles), Kruk (purchase of attack helicopters) and Orka (purchase of submarines) was registered. “We will also rebuild the combat capabilities of the Navy. We have prepared a bridging solution for submarines, we will not give up any of the programs related to the expansion of the Polish Navy," the minister stressed. One of the areas that will be modernized under the Plan is cyber security. “In the technical modernization plan, we also focus on the purchase of modern cryptographic and IT equipment for the defense forces in cyberspace. Expenditure for the cyberspace defense forces will amount to PLN 3 billion (€700 million),” said Minister Blaszczak. “The value of the Technical Modernization Plan, by 2026, that is 185 billion zlotys (€43 billion), but the needs are much larger. (...) I am very happy that the Parliament and the President have accepted the extension of the planning perspective to 15 years, so we are already working on the Technical Modernization Plan until 2034. The PiS government's achievement is also the introduction of the 2017 law, which increases defense expenditures to 2.5% in 2030, so these financial expenditures are growing every year. The opportunities from year to year are also growing, so we invest effectively in defense. For the PiS government, previously the government of Beata Szydło, and now under the government of Prime Minister Mateusz Morawiecki, security was, is and will be a priority,” the minister added at the end. In 2018, the Ministry of National Defense prepared "Detailed directions of reconstruction and technical modernization of the Armed Forces for 2017-2026", which were adopted by the Council of Ministers. Then, the head of the Ministry of Defense signed an order introducing the "Armed Forces Development Program". The Technical Modernization Plan is another of the strategic documents adopted by the Ministry. Acquiring a new generation multi-mission aircraft that will introduce a new level of quality in aviation operations. A multipurpose aircraft will operate in an anti-access and network-centric environment and will cooperate with components of allied air forces. Acquisition of anti-aircraft batteries of short-range missile systems to defend against unmanned aerial vehicles, as well as incoming missiles. We anticipate extensive use of the Polish arms industry and technology transfer among others the ability to producethe required missiles. Acquisition of modern shock helicopters for aviation of land forces. As part of the Cyber.mil operational program, we will acquire domestic tools and software that will enable us to carry out effective operations in cyberspace, with the latest Polish cryptographic technologies. We will mainly use the capabilities of Polska Grupa Zbrojeniowa and Exatel, and we intend to allocate PLN 3 billion to the program itself. The WISŁA anti-aircraft and anti-missile program of will be one of the main elements forming the national air defense system. On March 28, 2018, Minister Mariusz Błaszczak signed a contract for the implementation of the first stage of the WISŁA program. Its basic task will be to fight manned and unmanned aerial attacks as well as tactical short-range battle missiles and maneuvering missiles. Acquisition of unmanned aerial vehicles of medium-range tactical class. Acquisition of unmanned aerial vehicles intended for use mainly in urbanized areas. Equipped with an opto-electronic head that allows observation day and night. Obtaining the coast defense ship, which is to replace the withdrawn from the service of the unit and increase the ability to cooperate in allied and coalition task forces. Acquiring the ability to damage surface and submarine targets by the New Type Submarine. This boat will increase the ability to effectively use the armaments and impact potential of ships in the field of combating surface, underwater and land targets, as well as destroying airborne anti-submarine forces. Acquiring 155 mm artillery modules. This equipment will enhance the fire support capability at the tactical level. The contractor is Huta Stalowa Wola. As part of the Technical Modernization Plan, it is planned to acquire further squadron modules. Acquisition of a squad module of multiple rocket launchers, capable of striking targets at ranges of 70 to 300 km. Acquiring anti-tank missile launchers. Thanks to the implementation of the program, the Polish Armed Forces will be equipped with new lightweight, anti-tank guided missiles, which do not require complicated training. Introduction of a new combat vehicle based on a universal modular tracked chassis developed and manufactured by the Polish defense industry for the Polish Armed Forces. It will replace, among others, the well-worn BMP-1 armored vehicle of Soviet construction, and will have the ability to swim. Acquiring high-mobility trucks and passenger cars. Planned increase in expenditure on technical modernization until 2026.